At ninety-eight, we all rotate. – Sunshine. Whimsy. Tacos. This is a story about a revolving door. One of the things that I see a lot of here that just doesn’t exist in Florida is the giant revolving doors that are in front of big stores, shopping malls, and so forth. Like this one. Well, exactly this one. There are regular doors on either side of the revolving section. That’s important in another paragraph or so. Over the last few days, I’ve noticed that the shoes that I wear to work are starting to disintegrate. They’re cracking badly on the spot that creases when I kneel down and the upper bends. The damage is severe enough that my feet are starting to get cold from the extra air flow, so after work today, I decided to walk over to one of the shoe stores I’d seen in the Regensburg Arcade. Whenever I walk over to the Arcade, I always decide whether to use the revolving door or the regular door based on a combination of where it is in the spin cycle, how crowded it is, and how much I’ll have to slow down when I get into the spin chamber. Tonight, I saw that it was just closing, so I angled to the door on the right instead. As I was approaching, I heard laughter from the other side, and when I looked up, the revolving part had stopped cycling entirely and had trapped one guy in a blue jacket inside. 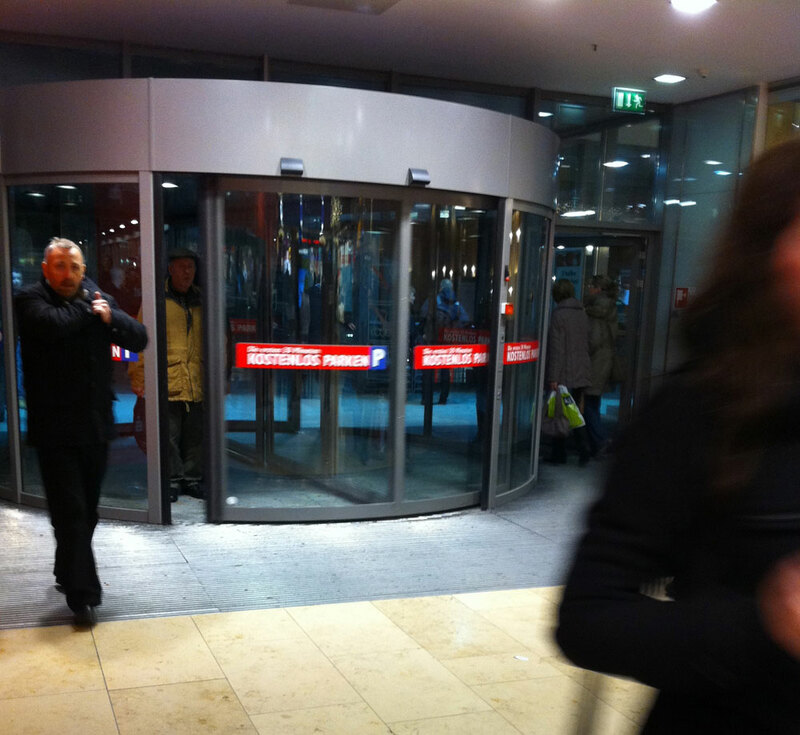 I felt bad for this guy, trapped in the middle of the revolving door. Normally you can push them, but this one was motorized so it seemed to be locked in place. Anyone who’s known me for a while knows that it’s in my nature to stop and try to help people. I’m not a doormat and I won’t usually go out of my way to ridiculous lengths to help people, but on a night like tonight when I have plenty of time, I can’t pass up the urge to help. Two problems: First, I don’t speak enough German to converse with everyone around me. Second, I had no idea who to tell if there was a problem with the door. The first thing that I did was to walk the full circle around the revolving door, looking for controls, buttons, and so forth. By this point in time, the poor guy trapped inside had noticed that I wasn’t just walking by like the other shoppers, and we exchanged amused glances. Some people would be freaking out; this guy was cool as a cucumber. It didn’t take long to figure out that none of the controls were helpful- they were designed to open it fully for wheelchair passage when it was already moving. I did find a light panel near the top that showed that it was in a fault condition- it seemed to think there was an obstruction. A helpful passerby, the only person to stop and help besides me, suggested that we try pushing. We had already done that, but we tried it again, without success. The new helpful person went off to the information desk (which I did not know existed) to tell them about the situation. As he walked away, I continued to try the different controls and levers and such on the door. After a few minutes, new helpful guy came back and mentioned that he’d told the management and they were on their way. While we waited, the guy stuck inside the door realized that the center partition of the revolving door was also a door, and this allowed him to move to the other side, where he could have better access to the part of the door that I was trying to get open. Once he was directly opposite me, we managed to successfully turn the door just enough for him to slip out. He thanked me briefly, then was on his way. Here’s the really funny bit. While all of this was going on, most people were just walking by. Unbeknownst to me, however, a group of four guys sitting at the restaurant just to the right of the revolving door had been following our little adventure, and when my blue jacketed friend finally slipped out of his revolving cage, a loud cheer went up from the table. When I turned to look, they had beer glasses raised in salute. I couldn’t help but laugh. The trip to the shoe store was a success, too. I did! I found shoes that are pretty nice, in fact. Much better than what I found at the “Schuh” place across from Globus. somewhere, a bunch of good karma tickmarks just got put under your name.